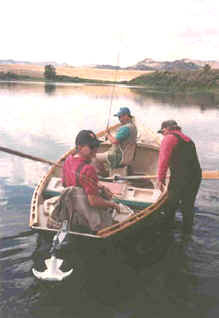 In 1805, when Lewis and Clark paddled, poled and pulled their way up the Missouri River, south of the Great Falls, past the Smith and Dearborn rivers to the mouth of Ordway’s Creek (Little Prickly Pear Creek), the river they were experiencing was much different from the river we know and fish today. Since that great adventure a series of four dams has been built taming the river and harnessing the water for hydro-electric purposes. The first dam is Toston, north of Three Forks and the second is Canyon Ferry, north of Townsend. The third dam is Hauser, east of Helena and the fourth is Holter, east of Wolf Creek. 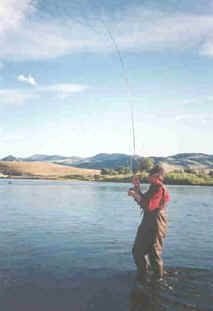 This series of dams has produced a blue ribbon wild trout fishery downstream from Holter dam to Cascade, Montana, known as a tailwater, which has gained an international reputation among fly fishermen for its hard fighting, acrobatic rainbow trout and at times, demanding technical skill level. The Missouri River below Holter dam has a population of approximately 2500 rainbow trout and 500 brown trout per mile and as one gets closer to the town of Cascade (30 miles downstream) the numbers fall to approximately 1500 rainbows and 300 browns per mile. 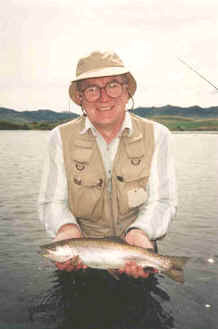 The heavy bodied rainbows average 15"-17" and the browns 16"- 18". While the adult rainbows rarely grow to over 20", it is possible to hook and catch browns of 20"+. The river is often characterized as a giant spring creek flowing over fine gravels and lush weed beds. It has a moderate flow of about 4 mph and can be easily floated in a driftboat with just one set of rapids north of exit 247 on Interstate 15. Depending on the flow and/or water releases from Holter dam the Missouri can generally be waded. The best time for the visiting angler to fish the Missouri during the summer months is July and August. At this time consistent mayfly and caddis hatches provide quality angling opportunities for the fly fisherman. In terms of hatches, usually by late June, PMD’s or Pale Morning Duns are hatching and by mid July, Tricos are in full swing. August brings hoppers, however, terrestrials such as ants and beetles can be effective patterns at any time. Early in the season larger dry fly patterns can be good choices and as the season progresses anglers fishing smaller flies which sit low in the water will have more success. Comparaduns and parachutes in sizes # 14-20 are examples of such patterns. Matching fly patterns in color and size to the hatch will increase ones chances of catching fish. Nymph fishing anytime can also be rewarding and usually Hares Ears, Prince and Bead Head imitations in sizes # 12-16 are always good choices. Depending on the snowpack in the headwaters, the variable spring temperatures and demands for downstream irrigation needs, the summer flows in the Missouri can vary from year to year. Last year (1997) the Missouri featured record flows of 25,000 cfs in June whereas just a few years earlier the flows were 4,000 cfs for the same time frame. As a general rule, if the early season flows tend to be somewhat high (9-10,000 cfs), then the later summer (August) fishing can be very good. On the other hand, if the early summer season flows are somewhat low (4,000 cfs) which means excellent early fishing, then its possible that the later summer fishing can be more demanding. Low water in the late summer means, higher water temperatures and more fish having been educated by more fishermen, which can mean lower catch rates by the visiting angler. 4 and 5 wgt. fly rods set up with double taper lines and longer leaders (12’-14’) including tippets of 5x and 6x are the best all-round systems for fishing the Missouri. Be prepared to have the fish make long runs and jump several times, so having at least 75 yards of backing on your reel is a requirement. If you are planning a trip to fish the Missouri River, one can fly into Great Falls or Helena, Montana by way of Northwest or Delta airlines. Car rentals are available at both airports and its just a quick 45 mile drive on Interstate 15 to the blue ribbon section of the Missouri River (Wolf Creek - Craig area). Local lodging and accommodations can be found in Wolf Creek, Craig or at Holter Lake. Fly shops are found in both Wolf Creek and Craig. 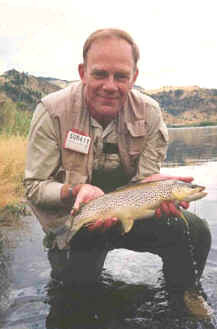 If you are interested in fishing the Missouri River contact Greg Mentzer, outfitter/owner of Montana River Guides. He has been guiding on the Missouri River since 1985. Copyright © Gregory G. Mentzer, May 1998. All rights reserved.